Newly released autopsy reports reveal that Las Vegas shooting suspect Stephen Paddock died more than 12 hours after police claim he committed suicide. Las Vegas – As Americans search for answers to the questions surrounding reports of a mass shooting at a high school in Florida, the alarming autopsy results from a mass shooting in Las Vegas, which show that the suspected gunman died more than 12 hours after he reportedly committed suicide, are being ignored. 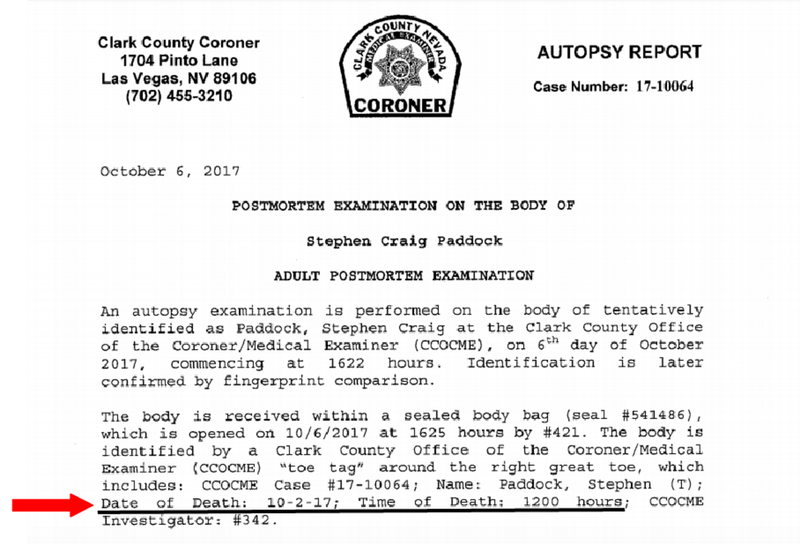 The autopsy was conducted on Oct. 6, 2017, by a team of detectives who claimed Paddock weighed 224 lbs. and was 6 feet tall. According to the report, he was wearing a brown long-sleeve shirt and black pants, which match the outfit worn in photos released from the hotel room that showed what was purported to be Paddock’s dead body after the shooting. The report confirmed that Paddock died as a result of a gunshot entering his mouth, and he was found with a bullet lodged in his brain, in between his occipital dura and occipital skull. While the mainstream media focused on the fact that the autopsy determined Paddock was overweight and he had anti-anxiety drugs in his system—which was public knowledge within days of the shooting—the claim that Paddock died more than 12 hours after police claimed he committed suicide should raise some serious red flags. In an updated timeline last month, the Los Angeles Times released what it referred to as “The most comprehensive look yet at how the Las Vegas concert massacre unfolded.” It was based on an 81-page investigative report from the Las Vegas Police, claiming that Paddock had died from a self-inflicted gunshot wound by the time officers entered his room at 11:20 p.m.
10:12 p.m.: Two armed Mandalay Bay security officers arrive on the 32nd floor, and the police and security officers on the 31st floor realize that the shooting is coming from one floor above them. 10:15 p.m.: Paddock fires his final shots at concertgoers. 10:16 p.m.: The two police officers on the 31st floor enter the stairwell outside the 32nd floor hallway but do not confront Paddock. 10:57 p.m.: Police breach the sealed 32nd-floor stairwell doorway. 11:20 p.m.: Police use explosives to blow open Paddock’s door, and they discover him dead. 11:26 p.m.: Police breach the interior door to Paddock’s second room, where a police officer accidentally fires three rounds into the room. However, while there have been a number of significant changes to the timeline of the shooting, none of them have suggested the possibility of Paddock’s death occurring the next day, hours after his name was released as the only suspect in the massacre. As The Free Thought Project has reported, the first reports of gunfire happened at 10:08 p.m. on Oct. 1, and Paddock’s name was then released publicly at 3:30 a.m. on Oct. 2, with the claim that he committed suicide before police entered his hotel room. It should also be noted that Paddock’s girlfriend, Marilou Danley, who was reportedly visiting family in the Philippines at the time, set her Facebook account to private at 12:38 a.m. and then deleted it entirely at 2:46 a.m.—nearly one hour before Paddock’s name was publicly released as the suspect in the shooting. The Clark County Coroner’s Office fought the release of the autopsy report, choosing to pay more than $32,000 in legal fees instead. Now it is clear that the revelation that Stephen Paddock actually died at 12 p.m. on Oct. 2, 2017, may have been what they were trying to hide, because it calls the validity of every police officer and FBI agent involved in the investigation into question, and it opens a new host of questions about how the massacre unfolded.